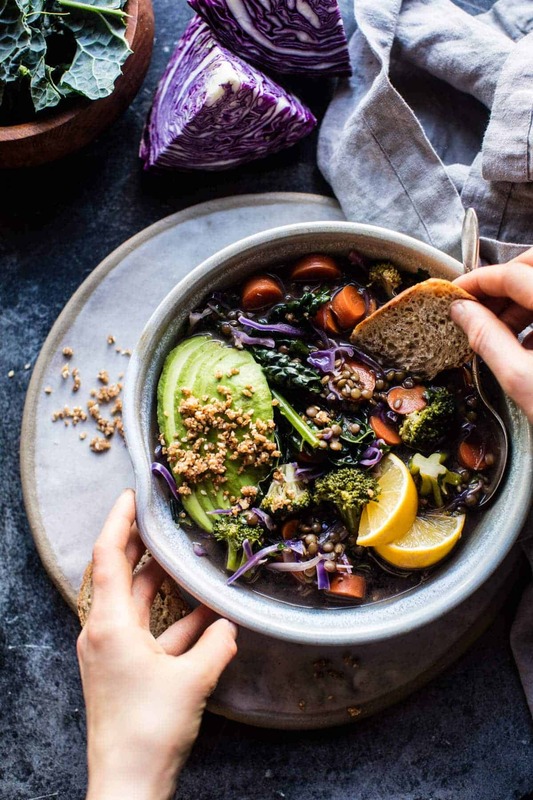 Mean Green Detox Vegetable Soup. I have the perfect recipe to kick off 2017. I know everyone is thinking about salads, green juices and other “health foods” to kick-start their healthy eating into action after two weeks of holidays eats. Well, I am really excited, because today is the start of Healthy January 2017! I have so many recipes to share this January that are anything but plain or boring. This soup is only the start, but I knew when I made it that I had to share this recipe as the first recipe of the year. It’s literally one of the cleanest recipes I’ve ever made, but also warming, cozy and delicious. 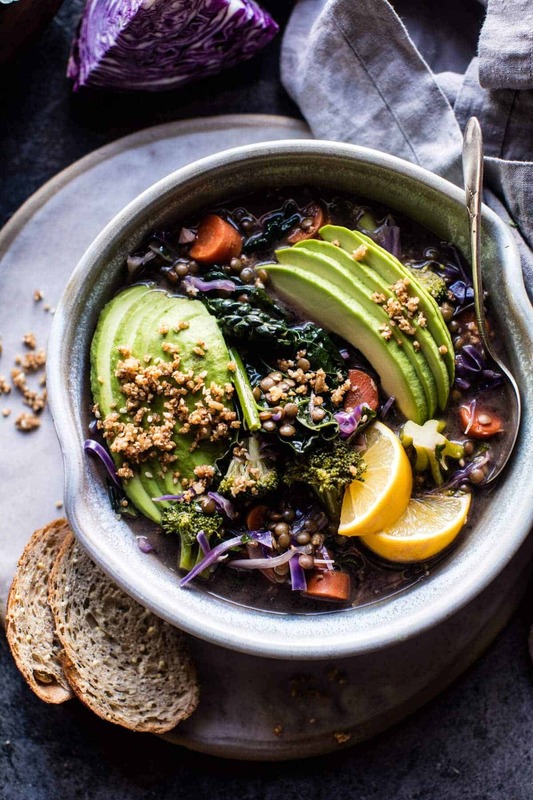 This Mean Green Detox Vegetable Soup is packed with all kinds of winter vegetable, green lentils for protein, and spices like garlic, ginger, and cayenne that will help fight off winter colds plus rev your metabolism. So you see…the perfect soup for the first Monday of the year! Speaking of the New Year, how was everyone’s holiday season. As you know, my Christmas was great and was spent with my family doing lots of cooking. New Year’s Eve was pretty laid back, we had all kinds of food including, Mexican tamales, poke, pasta and cookies! Nothing crazy, but after a busy two weeks, a laid back New Years was perfect. The last of our guests will be leaving tomorrow and Wednesday, so life should be getting back to normal here by the end of the week. I’m sad to see the holidays go, but excited for January and to get started, and to move on to new adventures! Do you guys have any New Year’s resolutions/goals? I still have not made a list, but I plan to make one up this week of some of the work goals I have floating around in my head. What kind of goals are you guys making this year? Obviously my first task of the year is to share all of these healthy January recipes! Ok, AND to finally finish up the cookbook…getting so close! So, let’s talk soup! Last year, I did a mean green salad, the year before I did a mean green smoothie, and this year, it’s soup! Lately I am really loving broth based recipes. This soup has got to be my new secret weapon for revving up my metabolism. I plan to make it anytime I feel the slightest bit of sickness coming on. I swear, it heals all. This soup is filled with all the things that make me feel good. For my veggies, I went with carrots, broccoli, kale, and purple cabbage. Then I seasoned it up with loads of fresh ginger, garlic, cayenne, soy sauce and a splash of apple cider vinegar. Next I added lentils for heartiness and then finished the soup off with some fresh parsley, lemon juice and vegan parmesan (you can use regular parmesan too…that’s obviously just as amazing). It’s basically perfection in a bowl and so super healthy. And it’s also easy to throw together, just one pot and ready in just around and hour. See, January is already looking pretty good right? Question: I already have a lot of this month’s recipes planned, but is there anything that you guys would really like to see this month? Or even better, is there anything on the blog that you would like to see happen over the next year? I’d love to hear any feedback you guys have on what you are lovin’ or what you’d like to see more of. Please let me know so we can make this the best year of HBH yet!! Hope you all have a great first Monday of the year!! 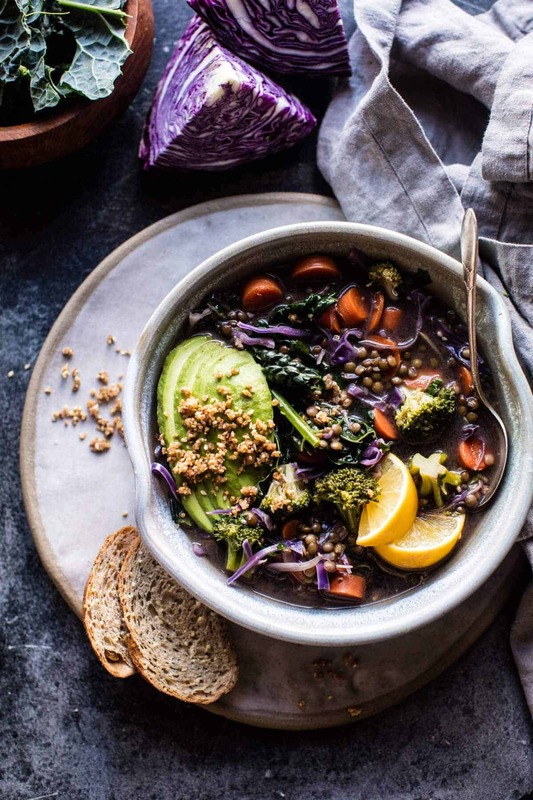 This Mean Green Detox Vegetable Soup is packed with all kinds of winter vegetable, green lentils for protein, and spices like garlic, ginger, and cayenne that will help fight off winter colds plus rev your metabolism. Heat the olive oil in a large pot over medium heat. When the oil shimmers, add the leeks and carrots. Cook, stirring occasionally for 5 minutes. Add the garlic and ginger and cook another 30 seconds to 1 minute. Season with salt and pepper. Add the cayenne, broth, soy sauce, and vinegar. Add 2 cups water and bring the soup to a boil over high heat. Stir in the lentils, reduce the heat to medium and simmer for 20 minutes. Add the kale, broccoli, and cabbage and continue cooking until the lentils and broccoli are tender, about 10-15 minutes longer. Just before serving, stir in the lemon juice, parsley and cilantro. Taste and season with more salt if needed. Ladle the soup into bowls and top with vegan parmesan. 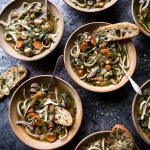 Winter Vegetable Chicken Noodle Soup with Asiago Crostini. 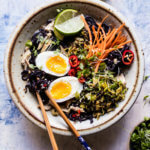 Detox Coconut Lemongrass Chicken Ramen. 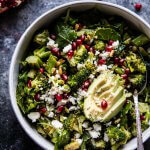 Lemon Garlic Roasted Broccoli Salad. Holiday Detox: The Mean Green Smoothie. Just what we need after the craziness of Christmas eating. Also vibrant and colourful, it feeds the eyes as well as the soul. So glad you are enjoying these! Thank you Elinor! Wow this is beautiful and looks delicious! I’m really looking forward to the rest of your healthy January recipes! Yay! I cannot wait to share them with you guys! Thanks Rhian! I haven’t cooked much with lentils other than the canned variety, mainly because I thought they took a long time to cook. Do they all cook in an hour? Or is it just green lentils? This recipe looks delicious and exactly the sort of meal I am wanting to make more of this year for health reasons. Hi Lynne, lentils typically take around 20-20 minutes to fully cook. Some people like to soak them over night in water to help quicken the cooking time, but I do not do this. Let me know if you have questions. Hope you love the soup! The holidays, or I call them holidaze, is a wonderful time to enjoy family and friends, but I did not eat healthy all of the time. I need a bowl of soup full of greens to nourish me and I must get back to the gym on a regular basis, too. That sounds like an awesome plan and a great New Years resolution!! Thank you Jude! I could honestly do with a little detox after the hols ahahahaha!!! Have a great year, Tieghan! Haha yes, me too lol! I hope you love this, Ruth! Thank you! Yes! This looks like an awesome way to start the new year off right, just what I need! Perfect! I am so glad you are enjoying this, Tori!! Thank you! Oh my thank you so much. 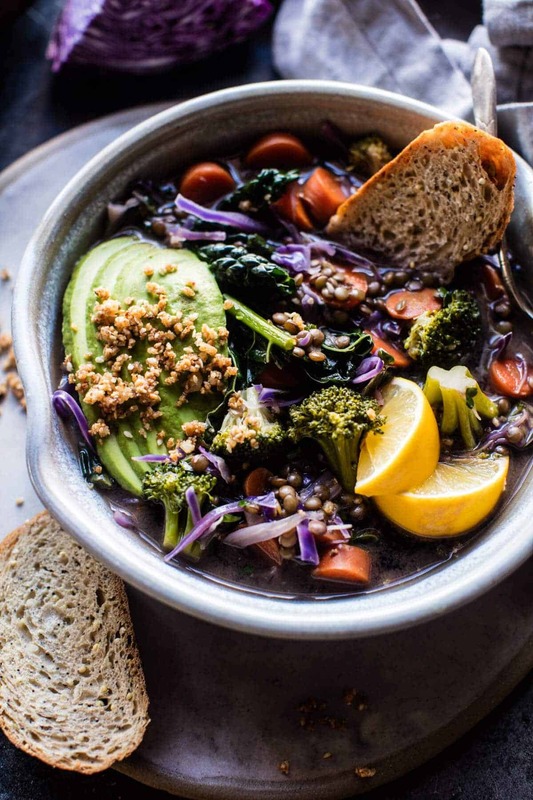 “Mean ALMOST green detox veggie soup”. to lose 70 pounds is our goal for him..
We did this years ago with Weight Watchers…but trying a diff approach now. And I am going to add this soup in the regime, several times over the next couple of months. Happy New Year to you as well Leslie! I hope everything goes well with the new, healthy eating lifestyle. Let me know how you guys like this soup! Thank you! What to use if you don’t like lentils? Happy New Year Melanie! So glad you loved the mushroom ravioli and I hope you love all of the recipes for healthy January!! I am so excited to share them with you guys! Thank you! Such a healthy soup! I love all those gorgeous vegetables in there! This is gorgeous. I feel like I’m not alone in craving a big bowl of this after the holidays. Thanks for the recipe! Thank you Tisha! I hope you love this soup. Thank you!! I love the name of this soup and the other recipes with a similar one 🙂 This soup looks so bright and colorful and also looks like it would hold well for leftovers throughout the week. I like to make a soup or stew early in the week so it can last for a few dinners and your blog is my go to for those recipes! Thank you! I hope you love this soup, Jessie! Thank you so much! Thank you so much Rachel! I hope you love the recipes for Healthy January! Can you do this in a slow cooker? Yes, that would be great! 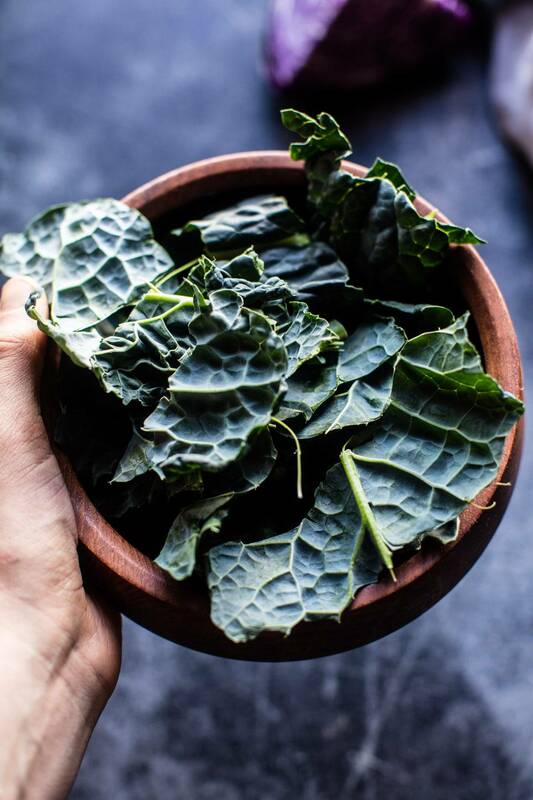 Add everything but the kale to the crockpot, cover and cook on low for 6-8 hours or high for 4-6 hours. Should be awesome! Hope you love this! Hi! Happy New Year to you! I made your puff pastry bacon and cheese twist sticks and they were a hit! That being said, I’m also really excited for healthy January! I would love a behind the scenes look at your cookbook process! It would be awesome to get a look at “A day in the life”, your shopping for food and fashion! Some fun places you like to visit when your out and about! I am so glad you liked the bacon and cheese twist sticks! Thank you, I will look into those posts! I think you may have forgotten to include the avocado in the recipe?!! But it looks amazing, hoping the grocery store has everything I need to make this tomorrow. Congrats on an amazing year, Half baked harvest is the only food blog I check on a regular basis and I recommend it to all my friends! Chicken drumsticks and ground turkey are two things I always have in my freezer, I know they are pretty unexciting but I would love to see some easy weeknight meals with those. Cannot wait for the cookbook! So happy you love this! Thank you Caroline! Haha yes the holidays were definitely all about indulging.. I am so glad you are liking this recipe, Rebecca! Thank you!! Have been loving your site for awhile now. Keep the soups and chowder recipes coming. Maybe include some hearty dinner salads with added protein. Thank you for sharing your talent! Thank you so much for the suggestions Dina!! Thank you! Thank you for another lovely recipe. I look forward to making this soup and to see what else you have planned for the new year! Maybe some more potato, banana, and bread recipes? My family is English so there’s often potatoes in the house when I visit. ? And maybe some more simple salads and desserts? (Like the persimmon salad and apple crumble cake you made a while back!) yum! Anyway, no matter what you come up with I feel as though it will still be wonderful! I look forward to the book and seeing what’s cooking in 2017! Awesome suggestions! Thank you so much Kristin! Awesome! I hope you love this soup, Laura! Thank you! Happy New Year! I am so with you on trying to eat healthier after all the festivities. I don’t do resolutions, but I am trying to be more efficient and work on my organizational skills this year! And this soup looks incredible! This is a perfect time to get organized! Thank you so much Amanda! Your blog is the first thing I read every single morning and I am SO excited about a month of healthy recipes. I made this soup this afternoon and it’s so perfect. Cannot wait to see what else is in store! Yay! So glad you are as excited as I am! Thank you Gina! Boy could I use about 10 bowls of this soup Tieghan! Thanks for sharing! And Happy New Year! Well I hope you love it Mary Ann! Thank you so much! Is that an avacado in there? Hey Rebecca! Yes, that is an avocado on top! I am so glad you are excited, too! Thank you Sarah! This soup looks delicious! Will try this week for sure! I’m vegetarian and absolutely love your veggie recipes, keep them coming! Do you think you would ever venture into the tofu category? I would love to see what you come up with! Happy New Year! Hey Amanda! Thank you so much, I am so happy you are enjoying this recipe! I will take that into consideration! (: Happy New Year! Love your recipes and your website!!! Ah yay! So happy you like it Gina! I know it’s probably absolutely freezing where you are, but I was wondering if this January you might be able to post a couple of recipes that are more suitable for summer? 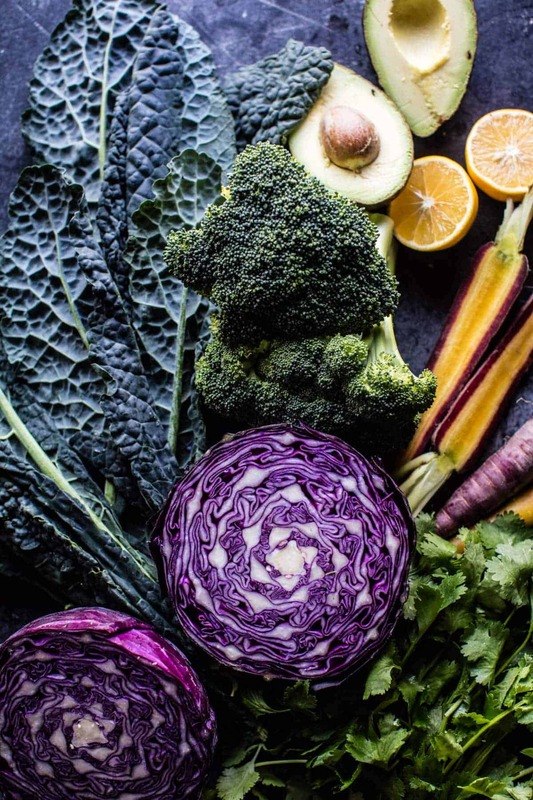 I’m following your blog religiously from the southern hemisphere, and much as I love this healthy wintery food, it would also be awesome to have a couple of ideas more suitable to the current (very hot) weather. Hi Emily! It is freezing here, but I do have some recipes coming up that I think will be great for warm or cold weather!! I will keep this in my though when planning the rest of the months recipes. Thanks so much for the kind feedback! 🙂 Happy New Year! Love the soup! I’ll definitely try this! I always love your recipes, but my absolute favorites are the big salads/veggie heavy meals – I get rave reviews when I make them. Thank you Matt! I hope you try this & like it!! I could use a little detox like this! Gorgeous dish and photos. Just made this dish for my family. Thank you for sharing it! It had the perfect level of spice for the older ones in the group but I might halve the cayenne next time for the youngest kids. Thanks for the post, it felt great to chop only veggies again! I am so glad you liked this Arian!! Thank you so much! Ah, this is absolutely PERFECT! The colors pop perfectly! Personally, I’m looking to gain some weight (in muscle, of course! ), but I totally love these super healthy recipes that pack in the perfect nutritional and flavorful punch! And the avocado is the BEST addition to this soup! Happy New Year girl! Wow- my body needed this badly…just finished the last tablespoon full on a bitter cold evening! After all of the past months of decadence, I literally felt my bloodstream say “thank you, thank you, no, THANK YOU” Love the depth and body this has- the soy sauce did wonders to the flavor. 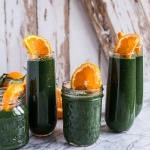 Was concerned that this recipe just would taste oh-too-healthy for comfort food me, but only you could make this mean green potion amazing & delicious! So I thank you & my body does too! Happy to have found you- love love love every single recipe! Xoxo. Also, more grain salads and things that make good leftovers for lunches. Thank you for this recipe! Made it to take to work for lunch last week. Different from any soup I’ve made before, the flavors were great! I am so glad you liked it, Jillian! Thank you! This soup is SOOOO DELICIOUS! Thank you!!! Yay, so happy you like it! Thank you Sophie! This soup came out AMAZING! I know you are big on indulgent meals but your “healthy” dishes are incredible. 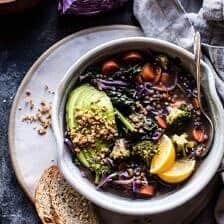 This detox soup and the detox salad are both on my constant rotation. I LOVE them! Thank you! I am so glad that you love this, it is also one of my favorites! I just made this soup and it is amazing. It will now be a new staple for me when I want to detox or just have something cozy. Thanks for this recipe! I am so glad you liked this soup! Thank you Rachel! Hi, I’ve made this soup tonight and it’s absolutely delicious! But I’ve got far too much for this week… is it okay to freeze it? ?